Performing a computer experiment can be viewed as observing a mapping between the model parameters and the corresponding model outputs predicted by the computer model. In view of this, experimental design for computer experiments can be thought of as devising a reliable procedure for finding configurations of design points in the parameter space so that their images represent the manifold parametrized by such a mapping (i.e., computer experiments). Traditional space-filling designs aim to achieve this goal by filling the parameter space with design points that are as "uniform" as possible in the parameter space. However, the resulting design points may be non-uniform in the model output space and hence fail to provide a reliable representation of the manifold, becoming highly inefficient or even misleading in case the computer experiments are non-linear. In this paper, we propose an iterative algorithm that fills in the model output manifold uniformly---rather than the parameter space uniformly---so that one could obtain a reliable understanding of the model behaviors with the minimal number of design points. Rhee, C.H, Zhou, E, & Qiu, P. (2017). 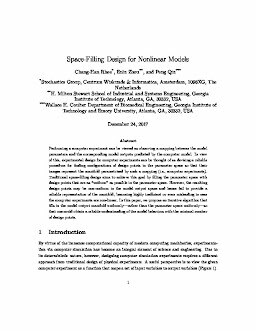 Space-filling design for nonlinear models.